We know that in every team there are a variety of document types that you use every day to collaborate and get your job done. 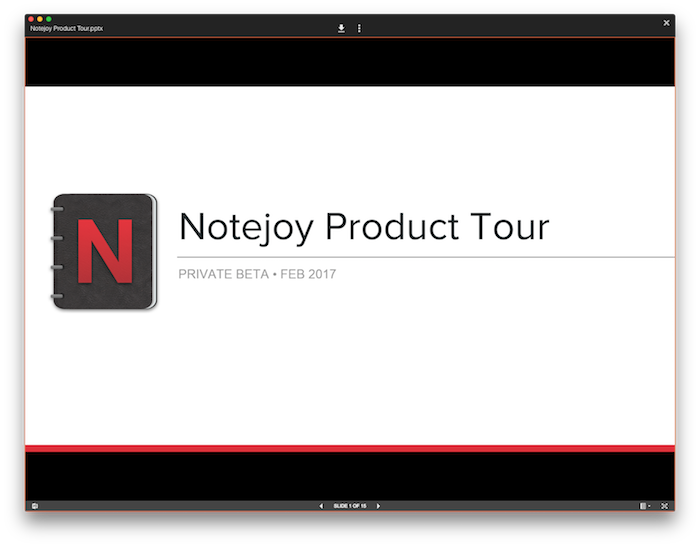 That's why we are excited today to announce the ability to upload and store documents in Notejoy. You can now easily upload documents into a note simply by clicking the paperclip at the bottom of note. You'll then be able to click into the document to get a fully-functional full-screen preview of the document and ultimately download the file if you need to. The full-screen document viewer works great with all Microsoft Office documents (Word, Excel, Powerpoint files) as well as PDFs. But feel free to store any file type for easy retrieval. This is just another way that Notejoy gives you a single place to point your team to for a project, making it easier than ever to collect and collaborate on everything related to a project.